Jared Goff had an absolutely miserable time in Super Bowl LIII. Quite honestly, his performance against the New England Patriots was among the most inept we’ve seen in a long time from a Super Bowl quarterback. That he was brutally bad is an indisputable fact: Goff completed just 19-of-38 passes for 229 yards (much of that came late). He failed to lead a single touchdown-scoring drive, and when his team needed him the most he threw an unconscionable interception to Stephon Gilmore that sealed New England’s sixth title. This performance came on the heels of a rough stretch for Goff at the end of the season, as well. As a result, some have wondered if he’s really the guy Sean McVay wants to build his offense around, and one prominent national writer suggested McVay could look to land Kirk Cousins in a couple of years instead of investing in Goff. Let me just stop you right there. Writing off Jared Goff right now would be just as dumb as saying he’s a complete bust after his horrifying rookie campaign under Jeff Fisher. Sure, Goff was slow to read the Patriots’ defense in Super Bowl LIII. Sure, his late pass to Brandin Cooks was a huge reason why the Rams didn’t score a touchdown. Sure, his interception to Gilmore in the final minutes was the straw that broke the camel’s back. But in no way does Goff deserve all the blame. McVay rightfully admitted after the big game that he was thoroughly outcoached. He never adjusted to New England going with zone coverage 90 percent of the time. He failed to establish the run — even in a game that was 3-3 until midway through the fourth quarter. Goff’s offensive line was atrocious, too. And despite the throw being late and high, Cooks should have caught that ball in the back of the end zone for a touchdown. Even putting all that aside, let’s not forget that Goff is still just a 24-year-old kid. He has a grand total of 38 regular-season starts under his belt. In that short period of time, he’s established himself as one of the NFL’s elite yards-per-attempt and yards-per-completion quarterbacks while throwing 65 touchdowns and just 26 interceptions. Those are incredible numbers for a young passer. Just to compare, Jameis Winston has 58 interceptions in 56 career starts, and Bruce Arians is absolutely chuffed to begin working with him in Tampa Bay this spring. McVay and Goff have plenty of room to improve. They both need to do better next year, and they both know it. 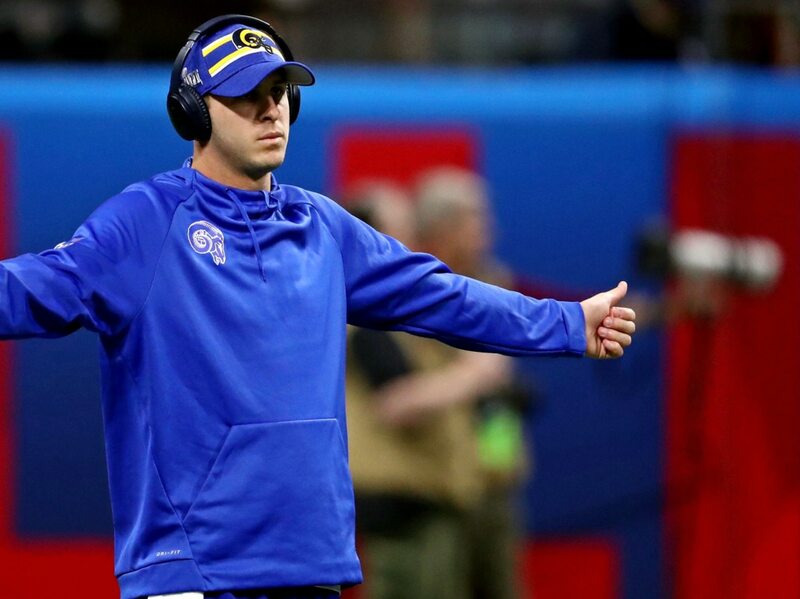 Just don’t for a second think that one abysmal performance in a Super Bowl that was as much of an away game as a Super Bowl can get somehow means Goff isn’t capable of bouncing back and showing out better than ever in 2019. Write him off at your own peril. As for me, I’m expecting great things from this young gunslinger in the future.